Why Do Blood Types Differ? Perhaps you know your own blood type, and perhaps you know those types with which you’re compatible to give to and receive from. You might also sense that there’s more to blood than a mere mark on your medical records. Blood consists of red and white blood cells, platelets and plasma (the goop in which everything sits). Antigens and various proteins float in the plasma and on red blood cells. An antigen is any substance that causes the immune system to produce antibodies — certain proteins — to fight it off. The ABO grouping system refers to the genetically-determined individual differences in the presence of two antigens (A and B), which stimulate the production of different antibodies. Type-O blood has both the antibodies produced in type-A and type-B, whereas type-AB has neither. “Polymorphism” describes a stable coexistence of different genetic forms within a species, and the reason for blood group polymorphism is not known. Why Do Air Traffic Control Towers Have Slanted Windows? Large airports are slightly different all over the world, but one constant is the ubiquitous air traffic control tower, which always has windows that slope toward the tower at the base. Many people assume that they are designed that way to prevent the sun’s reflection or glare from blinding incoming pilots. But this explanation doesn’t fly, because surrounding buildings (and the airport terminals themselves) have vertical windows. In fact the benefit is not for those outside the tower but those inside it. Ordinarily, we see (and ignore) reflections in glass all the time, for example from computer monitors or car windows. But air traffic controllers must not have any distracting reflections as they monitor flights. By tilting the glass away, any errant light from inside the tower (such as video screens, lights, etc.) are reflected up onto the ceiling, which is painted black. That way, the glow from a wristwatch across the room won’t be mistaken for an incomingUFO. 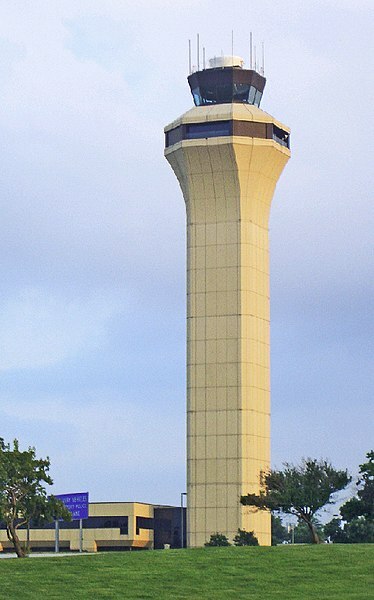 Within an airport, the control tower is usually the tallest structure, which rises high over other buildings. For medium-traffic airports, only one controller is necessary for a control tower to operate. In addition, such towers do not need 24-hour operations. On the other hand, busierairports need several controllers and support staff in order for their control towers to function efficiently. Unlike less busy airports, these towers need to operate 24-hours all year long. Control towers usually have common features like an impact-resistant cab glass, pressure and wind gauges as well as light guns for communication purposes. At the same time, these structures have strip boards that allow Flight Progress Strips, reliable telephone systems and radio communications. Aside from these, they may also have computerized systems for briefing, flightdata and meteorological information. When the solar wind dies down, an outer layer of Venus’s atmosphere billows outward (illustrated on right), making the second planet from the sun look like a comet. The planet Venus sometimes looks less like a planet and more like a comet, scientists say. Scientists with the European Space Agency have discovered that a part of the upper atmosphere of Venus— its ionosphere — acts surprisingly different depending on daily changes in the sun’s weather. The side of Venus’ ionosphere that faces away from the sun can billow outward like the tail of a comet, while the side facing the star remains tightly compacted, researchers said. The discovery was made using ESA’s Venus Express spacecraft, which observed Venus’s ionosphere during a period of low solar wind in 2010 to see exactly how the sun affects the way the planet’s atmosphere functions. In 2013, the sun is expected to reach the peak of its 11-year solar activity cycle. “As this significantly reduced solar wind hit Venus, Venus Express saw the planet’s ionosphere balloon outwards on the planet’s ‘downwind’ nightside, much like the shape of the ion tail seen streaming from a comet under similar conditions,” ESA officials said in a statement today (Jan. 29). It only takes 30 to 60 minutes for the planet’s comet-like tail to form after the solar wind dies down. Researchers observed the ionosphere stretch to at least 7,521 miles (12,104 kilometers) from the planet, said Yong Wei, a scientist at the Max Planck Institute in Katlenburg, Germany who worked on this research. Earth’s ionosphere never becomes comet-like largely because the planet has its own magnetic field that balances out the sun’s influence on the way the atmospheric layer is shaped. Venus, however, doesn’t have its own magnetic field and is therefore subject to the whims of the sun’s solar wind. Researchers think that Mars behaves in much the same way. The Red Planet doesn’t have a magnetic field to mitigate the influence of the sun’s wind either. The Venus Express spacecraft launched in 2005 and has been orbiting the second planet from the sun since 2006. The spacecraft is equipped with seven instruments to study the atmosphere and surface of Venus in extreme detail. The spacecraft is currently in an extended mission slated to last until 2014 . Our sun isn’t the only object in the sky that can produce spectacular optical effects. Take this photograph taken by Sebastian Saarloos on a cold, starlit Alaskan night. 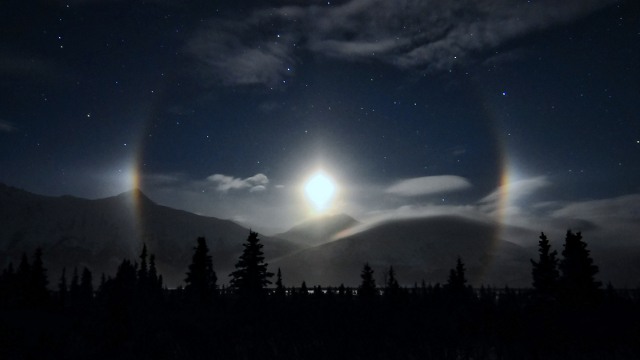 This is what’s called a “moondog” — a rainbow-like ring around the moon that’s caused by the reflection of moonlight (which is reflected sunlight) from ice crystals in the upper atmosphere. 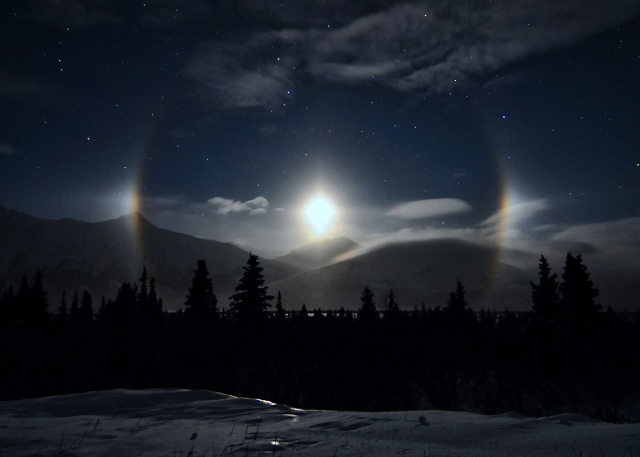 The slightly overexposed photograph shows misty mountains in the background, along with an icy halo that surrounds the moon. Interestingly, because all ice crystals tend to have the same hexagonal shape, the moon ring is always the same size; moondogs, also known as paraselanae, are typically seen at an angle of 22 degrees. Photograph courtesy Sebastian Saarloos. It was taken on January 17, 2013 from Lower Miller Creek, Alaska, USA. Ghosts have been a popular subject for millennia, appearing in countless stories, from “Macbeth” to the Bible, and even spawning their own folklore genre: ghost stories. Ghosts are perhaps the most common paranormal belief in the world. Part of the reason is thatbelief in ghosts is part of a larger web of related paranormal beliefs, including near-death experience, life after death, and spirit communication. Still others create their own special categories for different types of ghosts, such aspoltergeists, residual hauntings, intelligent spirits and shadow people. Of course, it’s all made up, like speculating on the different races of fairies or dragons: there are as many types of ghosts as you want there to be. Carol Anne: Hello? What do you look like? Talk louder, I can’t hear you! Poltergeist helped define a paranormal culture in the United States. Benjamin Radford is deputy editor of “Skeptical Inquirer” science magazine and author of six books, including “Scientific Paranormal Investigation: How to Solve Unexplained Mysteries.” His website ishttp://www.BenjaminRadford.com. The identity of a mysterious patient who helped scientists pinpoint the brain region responsible for language has been discovered, researchers report. The new finding, detailed in the January issue of the Journal of the History of the Neurosciences, identifies the famous patient as Monsieur Louis Leborgne, a French craftsman who battled epilepsy his entire life. was admitted to the Bicêtre Hospital outside Paris for aphasia, or an inability to speak. He was essentially just kept there, slowly deteriorating. It wasn’t until 1861 that the man, who came to be known as Monsieur Leborgne, or “Tan,” for his only spoken word, came to the famous physician Paul Broca’s ward at the hospital. Shortly after the meeting, Leborgne died, and Broca performed his autopsy. During the autopsy, Broca found a lesion in a region of the brain tucked back and up behind the eyes. At the time, scientists were debating whether specific areas of the brain performed specific functions, or whether it was an undifferentiated lump that did one task, like the liver, said Marjorie Lorch, a neurolinguist at Birkbeck, University of London, who was not involved in the study. “Tan was the first patient whose case proved that damage to a specific part of the brain causes specific speech disorders,” said study author Cezary Domanski, a medical historian at the Maria Curie-Sklodowska University in Poland. Yet Tan’s identity remained shrouded in mystery. Most historians believed he was a poor, illiterate laborer, while others said he had gone mad from syphilis and that madness could explain his inability to speak. To discover just who he was, Domanski began to retrace the man’s history. “It was a challenge, for 150 years no one could even determine the name of the man —the same man whose brain is exhibited in a museum and shown in many books,” Domanski wrote in an email. But looking through the old medical records, he finally uncovered a death certificate for Louis Victor Leborgne, who was born in 1809 in Moret, France. Domanski then used archival records to discover that Louis Leborgne was one of seven children of a teacher (his father) and his wife, and that his siblings were educated. He moved to Paris as a child. In the hospital, his condition worsened and he eventually became paralyzed and bedridden, and underwent surgery for gangrene. He was dying when Broca first encountered him. The new discovery gives a very human identity to one of the medical textbooks’ most famous cases, Lorch told LiveScience. We’ve been told since we were children that we need to eat three square meals a day. But new research shows that we don’t need to be eating throughout the course of the day. And in fact, it might even be undermining our health. These insights have given rise to what’s known as “intermittent fasting” — the daily restriction of meals and caloric intake. Here’s why some health experts believe you should starve yourself just a little bit each day. For example, there’s Alternate Day Fasting (ADF) and the Two Day Diet (also known as the 5:2 diet). We’ll get into these in just a bit, but what’s really starting to take off is daily fasting — the practice of eating only during an 8-hour window of your choosing, and then fasting for the remaining 16 hours of the day. Now before we get into the details, it’s important to note that intermittent fasting is not for everyone. Before you try any of this, you should probably check with your doctor to make sure you’re healthy enough to go without food for an extended period — even if it’s just a 16 hour stretch. It’s also important to note that intermittent fasting is not really meant as a way to lose weight — though it happens to be a good way to regulate food intake. One of the most important studies in this area was conducted just last year at Salk’s Regulatory Biology Laboratory. In an experiment, biologist Satchidananda Panda and colleagues restricted the feeding of mice to — conveniently enough — an 8-hour period each day. The researchers were attempting to study whether obesity and metabolic diseases like diabetes were the result of high-fat diets, or from the disruption of metabolic cycles. It’s possible to extrapolate this to humans, too. Though anthropologists are not entirely sure how our paleolithic ancestors ate, it’s unlikely that they sat down for breakfast, lunch, and dinner. Those are eating routines from a more modern era — and even then, it’s likely that only the wealthy could afford multiple meals in one day. In all likelihood, our ancestors ate one or two big meals a day. And that was it. Consequently, their bodies were likely both adapted for and accustomed to going for extended periods without food during much of the day. Other studies point to similar conclusions. Take the work of Valter Longo, for example. 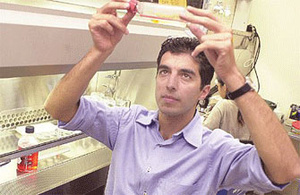 Longo, who works out of the University of Southern California’s Longevity Institute, has studied the effects of intermittent fasting on IGF-1, an insulin-like growth factor. Other research by Krista Varady of University of Illinois in Chicago haslooked at the way fasting impacts chronic diseases, like cardiovascular disease, type 2 diabetes, and cancer. 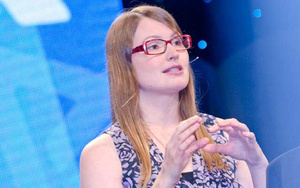 Her work, which involves both animal and human test subjects, seeks to compare the effects of intermittent fasting with caloric restriction (an extended low-calorie dietary routine that has known health benefits). Her tests on human subjects were not much different, which showed greater insulin-mediated glucose uptake. Her evidence suggested that fasting can increase HDL-cholesterol (that’s the good kind), while lowering triacylglycerol concentrations. Fasting had no effect on blood pressure. She concluded her study by suggesting that fasting can modulate several risk factors that are known to bring about various chronic diseases. 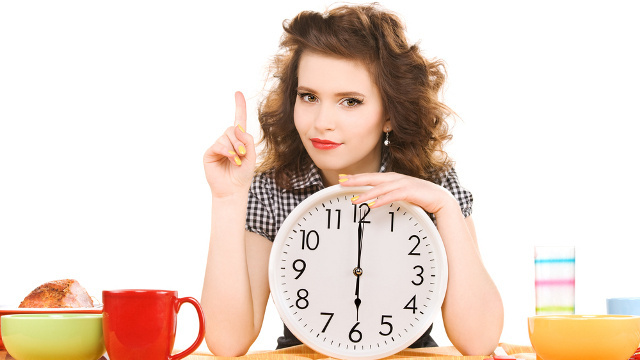 Varady recommends an alternate-day fasting routine in which there’s no need to restrict the quantity of foods for one day (yes, really), followed by a day in which no more than 600 calories can be consumed. Another typical intermittent fast is the so-called “5:2 diet.” People using this strategy are encouraged to eat normally for five days of the week, but two days are set aside for the fast in which no more than 600 calories are consumed. And there’s more. In addition to Varady’s study, other research shows that intermittent fasting can offer neuroprotective benefits. Studies on humans show that it can help with weight loss and reduce disease risk. And incredibly, there may even be a link to cancer. Another study studyby Varady and M. Hellerstein on mice indicated that both caloric restriction and alternate-day fasting can reduce cancer risk and reduce cell proliferation rates. 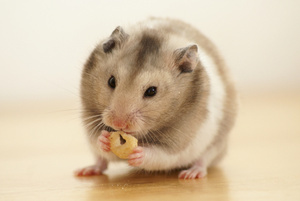 Short-term fasting can induce growth hormone secretion in men (which is a problem for guys after they hit 30), it reduces oxidative stress (fasting prevents oxidative damage to cellular proteins by decreasing the accumulation of oxidative radicals in the cell — what contributes to aging and disease onset), and it’s good for brain health, mental well-being, and clarity. I actually practice daily intermittent fasting, and I’ve been doing it for about five months. Admittedly, the first week was difficult, but now I don’t give it a second thought. My cravings have largely disappeared, but my stomach starts to grumble in the late stages. I feel great, though, my mood is upbeat, and I’m often full of energy (I also do strength-and-conditioning work, which helps). My particular routine — which is quite typical for daily intermittent fasters — sees me having my last meal of the day sometime between 6:00 and 8:00 PM. But then I don’t eat until 1:00 PM the next day. My lunch is usually a big deal, and I savor every bite (a neat benefit of the daily fast is how much better food suddenly tastes). Likewise, my dinner is also a grand affair. So I basically eat two solid meals each day, and fast for a 16 hour stretch. I also drink coffee and tea during the fasting period (both without cream and sugar). These are zero calorie foods that have little impact on the body’s metabolism. And not only that, caffeine is a known appetite suppressant. Lastly, I also tend to eat very little carbs. As many people know, carbohydrates are notorious for creating food cravings — carbs cause a kind of negative feedback loop. But as all this new research it’s showing, it’s not necessarily the kind of foods you eat. Rather, it’s the fasting that’s important. But that said, I wouldn’t tempt fate; it’s probably prudent to keep the foods healthy. As a final note, given that this is a restrictive dietary routine, it’s important to keep our health goals in mind as they relate to our daily enjoyment of life. Limiting our eating to such a small window of time could certainly be construed as a draconian measure. If a routine like this threatens to make you miserable, it may simply not be worth the bother. But for me, it’s not a problem, and fits in rather nicely with my overall health strategies. Images: lev dolgachov/Shutterstock, cath5/Shutterstock, Valter Longo,Krista Varady.